This Bubble Up Lasagna Bake is a fun twist on an old favorite and a great way to get the sauce, cheesy, meaty flavors you love without prep time and layering. My husband loved this one, though I have to make his without mushrooms – it still tastes great! 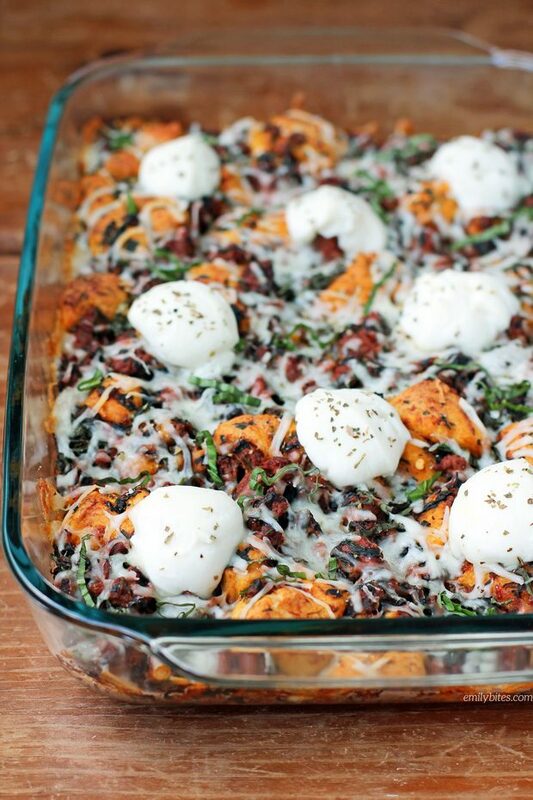 Better yet, a generous, filling serving of this casserole is only 335 calories or 8 Weight Watchers SmartPoints. 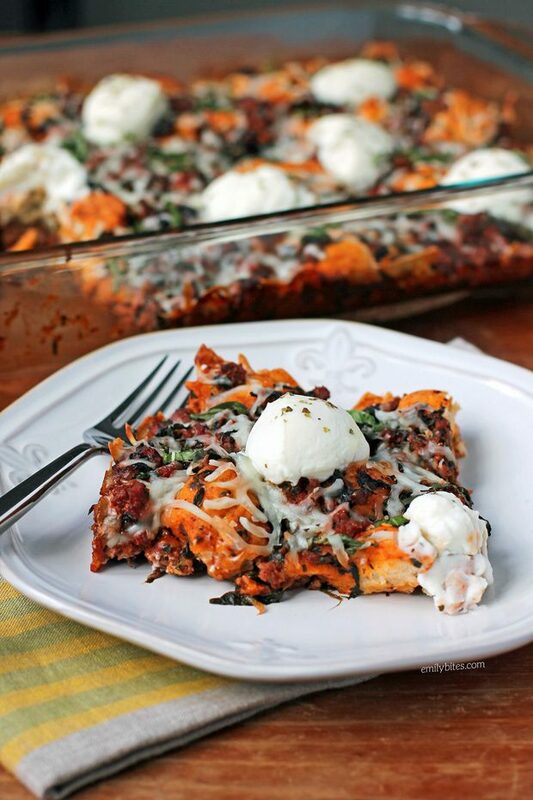 Looking for more easy, lightened up comfort food casseroles like this Bubble Up Lasagna Bake? Check out my Cottage Pie, Cheesy Buffalo Chicken Potato Bake, Layered Chicken Enchilada Bake, Chili Cornbread Bake, Teriyaki Chicken and Rice Casserole, Bubble Up Chicken Pot Pie Casserole, Chicken Parmesan Quinoa Bake, Cheesy Chicken Broccoli and Rice Casserole, Bubble Up Pizza Casserole, Chicken Cordon Bleu Pasta Bake, Sausage and Stuffing Brunch Bake, Deep Dish Sloppy Joe Casserole, Bubble Up Enchilada Casserole and many more in the casserole section of my recipe index! Bring a large skillet or saute pan over medium heat and add the ground beef. Cook beef, breaking up with a spoon or spatula for a couple minutes and then add the mushrooms. Cook both for an additional 6-8 minutes until the beef is cooked through in pieces and the mushrooms are softened. Stir in the garlic and cook for another minute. Stir in the tomato sauce, pasta sauce, spinach, salt, Italian seasoning, pepper flakes, pepper and biscuit dough pieces until well combined. Transfer the mixture to the prepared baking dish and spread evenly. Bake for 25 minutes. Remove from oven and sprinkle the Mozzarella over the top. Drop spoonfulls of the ricotta across the surface of the casserole and then sprinkle with a bit more Italian seasoning. Return to the oven for another 15 minutes until hot and bubbly. Top with additional sliced basil if desired. 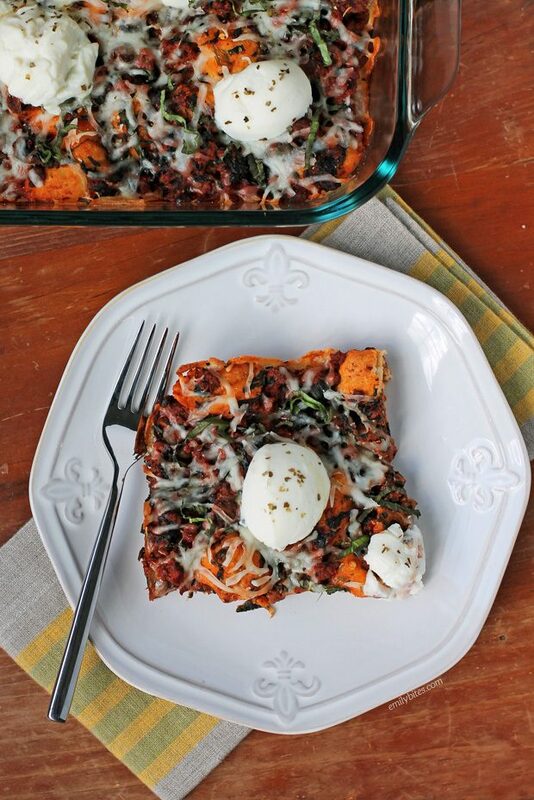 I love lasagna in general and this looks so different and delicious. Definitely need to add it to my meal planning rotation. Is it possible to make this without the spinach or is there something else that could be substituted? Just not a cooked spinach fan. Emily – once again a great recipe. We love, love, love your bubble casseroles! Like your husband, my husband and I are not mushroom fans so we just left those out. The only substitution I made was to use reduced fat ricotta as fat-free can be a real taste buster. I put it in the recipe builder using the brand of pasta sauce I used (Bertolli Tomato and Basil) and the type of biscuits I used (Pillsbury Grands) and it was 10 SP with the higher fat ricotta. Thanks again for a great recipe! Hi Emily! I can’t wait to make this! Heading to Wegmans soon- can you help? What is the difference between the tomato sauce and the pasta sauce? THANKS! Of course! Tomato sauce is just the plain tomato sauce that comes in cans (near the canned diced tomatoes, tomato paste, etc) and pasta sauce is the kind that comes in jars and is seasoned (like marinara). I hope that helps! I’m already working on my dinner menus for back to school. This will definitely be on the menu one night! What’s your thinking for using part tomato sauce and part pasta sauce? It looks like extra steps to use tomato sauce and add similar seasonings that are already in pasta sauce rather that just using all pasta sauce, but you must have had a reason. Also, the 1 1/4 pound beef is a little troublesome as all of my ground beef only comes in 1 pound increments. I’ll make it work though! Canned tomato sauce is zero WW points and doesnt have added sugar etc, so i often cut pasta sauce with a can of tomato sauce and extra seasonings. If you dont care about the points/nutrition info you can certainly use all pasta sauce. I’m sorry the amount of meat is troublesome for you, I generally buy it in bulk and freeze the meat I’m not using in different increments. You can use a pound if you like, it just won’t be quite as meaty and satisfying. Hope that helps. Do you bake the biscuits beforehand, or put them in raw? This sounds very delish, so I’ll definitely be making it very soon. Also, since spinach cooks down to almost nothing (especially the frozen kind), do you think that kale would work well in this dish? This is by far my favorite recipe you have and have made it countless times. However today the biscuits didn’t rise and were gummy and almost seemed raw. Ever run into this? Can you prep ahead your bubble up casseroles the morning before and just bake them off at dinner? Or will the biscuits get all weird?